James, son of Alphaeus (Ἰάκωβος, Iakōbos in Greek; Hebrew: יעקב בן חלפי Ya'akov ben Halfay; Coptic: ⲓⲁⲕⲱⲃⲟⲥ ⲛⲧⲉ ⲁⲗⲫⲉⲟⲥ) was one of the Twelve Apostles of Jesus, appearing under this name in all three of the Synoptic Gospels' lists of the apostles. He is often identified with James the Less (Greek Ἰάκωβος ὁ μίκρος Iakōbos ho mikros, Mark 15:40) and commonly known by that name in church tradition. He is also labelled "the minor", "the little", "the lesser", or "the younger", according to translation. He is distinct from James, son of Zebedee and in some interpretations also from James, brother of Jesus (James the Just). He appears only four times in the New Testament, each time in a list of the twelve apostles. James, son of Alphaeus is often identified with James the Less, who is only mentioned four times in the Bible, each time in connection with his mother. (Mark 15:40) refers to "Mary the mother of James the younger and of Joses", while (Mark 16:1) and (Matthew 27:56) refer to "Mary the mother of James". Since there was already another James (James, son of Zebedee) among the twelve apostles, equating James son of Alphaeus with "James the Less" made sense. (James son of Zebedee was sometimes called "James the Greater"). Do you intend the comparatively unknown James the Less, who is called in Scripture the son of Mary, not however of Mary the mother of our Lord, to be an apostle, or not? If he is an apostle, he must be the son of Alphæus and a believer in Jesus, "For neither did his brethren believe in him." The only conclusion is that the Mary who is described as the mother of James the Less was the wife of Alphæus and sister of Mary the Lord's mother, the one who is called by John the Evangelist "Mary of Clopas". Fresco of Saint James the Less in the Orthodox Church of Vladimir, Russia. 12th century. Statue of St. James in the Archbasilica of St. John Lateran by Angelo de Rossi. Jerome apparently voicing the general opinion of Early Church, maintains the doctrine of perpetual virginity of Mary. He proposed that James, son of Alphaeus, was to be identified with "James, the brother of the Lord" (Gal.1:19) and that the term "brother" was to be understood as "cousin." The view of Jerome, the "Hieronymian view," became widely accepted in the Roman Catholic Church, while Eastern Catholics, Eastern Orthodox and Protestants tend to distinguish between the two. Geike (1884) states that Hausrath, Delitzsch, and Schenkel think James the brother of Jesus was the son of Clophas-Alphaeus. And James the son of Alphaeus, when preaching in Jerusalem was stoned to death by the Jews, and was buried there beside the temple. It is important to remember that James, the brother of Jesus had the same death; he was stoned to death by the Jews too. This testimony of "Hippolytus", if authentic, would increase the plausibility that James the son of Alphaeus is the same person as James the brother of Jesus. These two works of "Hippolytus" are often neglected because the manuscripts were lost during most of the church age and then found in Greece in the 19th century. As most scholars consider them spurious, they are often ascribed to "Pseudo-Hippolytus". The two are included in an appendix to the works of Hippolytus in the voluminous collection of Early Church Fathers. According to the surviving fragments of the work Exposition of the Sayings of the Lord of Papias of Hierapolis Cleophas and Alphaeus are the same person, Mary wife of Cleophas or Alphaeus would be the mother of James, the brother of Jesus, and of Simon and Judas (Thaddeus), and of one Joseph. Thus, James, the brother of the Lord would be the son of Alphaeus, who is the husband of Mary of Cleophas or Mary the wife of Alphaeus. However, the Anglican theologian J.B. Lightfoot maintains that the fragment in question is spurious. James the Apostle is said the Less, how well that was the elder of age than was St. James the More. He was called also the brother of our Lord, because I have resembled much well our Lord in body, in visage, and of manner. He was called James the Just for his right great holiness. He was also called James the son of Alpheus. He sang in Jerusalem the first mass that ever was there, and he was first bishop of Jerusalem. Alphaeus is also the name of the father of the publican Levi mentioned in Mark 2:14. The publican appears as Matthew in Matthew 9:9, which has led some to conclude that James and Matthew might have been brothers. The four times that James son of Alphaeus is mentioned directly in the Bible (each time in the list of the Apostles) the only family relationship stated is that his father is Alphaeus. In two lists of the Apostles, the other James and John are listed as brothers and that their father is Zebedee. Mark the Evangelist is the earliest known source in the Bible to mention "James, son of Alphaeus" as one of the twelve Apostles. Mark the Evangelist mentions a "James, son of Alphaeus" only once and this is in his list of the 12 Apostles Mark 3:16–19. At the beginning of Jesus' ministry he first calls Peter and his brother Andrew and asks them to follow him Mark 1:16–17. In the next verses it tells the story of how James the Greater and his brother John the Apostle came to follow Jesus Mark 1:19–20. After some healing by Jesus he meets Levi son of Alphaeus who was a tax collector and he then asks Levi (better known as Matthew) to follow him Mark 2:14Matthew 9:9. Peter, Andrew, James the Greater and John the Apostle are listed as Apostles Mark 3:16–19. Levi, son of Alphaeus is listed as an Apostle under the name of Matthew, but James alone is listed as the son of Alphaeus Mark 3:16–19. Overall Mark the Evangelist lists three different Jameses. "James, son of Alphaeus", James the Greater and James the brother of Jesus (Mark 6:3). On three separate occasions he writes about a James without clarifying which James he is referring to. There is a James at the transfiguration Mark 9:2, at the Mount of Olives Mark 13:3 and the Garden of Gethsemane Mark 14:33. Although this James is listed alongside John the Apostle a clear distinction isn't made about which Apostle James is being referred to, even when both Apostles are meant to be in a similar location. All twelve Apostles attend the Last Supper Mark 14:33 which immediately precedes Garden of Gethsemane. There is a reference to Mary mother of James the Younger and Joseph (Mark 15:40); however, Mark the Evangelist has already told us that James the brother of Jesus has a brother called Joseph Mark 6:3. Peter, Andrew, James, son of Zebedee and his brother John were all called to follow Jesus Matthew 4:18–22. In a story that parallels the calling of Levi, son of Alphaeus, Matthew is called to follow Jesus (Matthew 9:9–13). Matthew is never referred directly to as being the Son of Alphaeus in the Gospel of Matthew or any other book in the Bible, but like Levi, Son of Alphaeus Mark 2:14. In Mark he is regarded as a tax collector Matthew 9:9. In the Gospel of Matthew the tax collector (Matthew) called to follow Jesus is listed as one of the twelve Apostles. James, son of Alphaeus is also listed as one of the 12 Apostles Matthew 10:3. Matthew doesn’t mention any James in his Gospel that isn’t identified without association to his family. There are 3 James that are mentioned by Matthew; James, Brother of Jesus, Joseph, Simon and Judas (Matthew 13:55), James son of Zebedee and brother of John (Matthew 10:2) and James, son of Alphaeus. At the Transfiguration it is specified that the James is brother of John (Matthew 13:55) and at the Garden of Gethsemane it is specified that it is the son of Zebedee (Matthew 26:37). It is not specified by Matthew that there was a James at the Mount of Olives; he mentions only disciples Matthew 24:3. Matthew also mentions a Mary the mother of James and Joseph who was at the crucifixion. This James is not given the epithet the younger Matthew 27:56. A James was arrested along with some other Christians and was executed by King Herod Agrippa in persecution of the church. Acts 12:1,2 However, the James in Acts 12:1,2 has a brother called John. James, son of Zebedee has a brother called John (Matthew 4:21) and we are never explicitly told that James son of Alphaeus has a brother. Robert Eisenman  and Achille Camerlynck both suggest that the death of James in Acts 12:1–2 is James, son of Zebedee and not James son of Alphaeus. In Christian art, James the Less is depicted holding a fuller's club. Tradition maintains that he was crucified at Ostrakine in Lower Egypt, where he was preaching the Gospel. ^ "Saint-James. Apostle, son of Alphaeus". Encyclopædia Britannica. Encyclopædia Britannica, Inc.
^ Matthew 10:3, Mark 3:18, Luke 6:12–16 and Acts 1:13. ^ saint, Jerome. The Perpetual Virginity of Blessed Mary Fragment 15. newadvent.org. Retrieved 3 September 2015. ^ a b of Hierapolis, Papias. Exposition of the Sayings of the Lord. Fragment X. earlychristianwritings.com. Retrieved 10 September 2015. ^ John Paul Meier, A Marginal Jew volume 3, p. 201. "There are no grounds for identifying James of Alphaeus – as church tradition has done – with James the Less." ^ Cross, FL, ed. (2005), "Brethren of the Lord", The Oxford Dictionary of the Christian Church, New York: Oxford University Press . ^ John Saward – Cradle of redeeming love: the theology of the Christmas mystery p18 2002 "St Jerome concludes that St James, son of Alphaeus, and St James, brother of the Lord, are one and the same person.169 But why is James, son of Alphaeus, called our Lord's 'brother'? St Jerome's answer is as follows. In Matthew 13:55 we hear of four 'brothers' of our Lord: James and Joseph, Simon and Jude. Later, in the Passion narrative, St Matthew mentions a Mary who is the mother of James and Joseph (cf Mt 27:56) "
^ The brother of Jesus: James the Just and his mission p17 Bruce Chilton, Jacob Neusner – 2001 "Given that James has been identified as the son of Alphaeus, Jerome indicates he cannot explain the connection of Mary the ... Chrysostom (347–407) was first to suggest that James the brother of the Lord is the son of Clopas though ..."
^ "CATHOLIC ENCYCLOPEDIA: St. James the Less". ^ John Cunningham Geikie The life and words of Christ Volume 1 1884 "Alphaeus, or Alpheus __, and Clopas are different ways of pronouncing in Greek the Hebrew name ___ (Chal'phai) ... Hausrath, Delitzsch, and Schenkel, think James the Just was the son of Clophas-Alphaeus." ^ of Rome, Pseudo-Hippolytus. "On the Twelve Apostles" and "On the Seventy Disciples". newadvent.org. Retrieved 10 September 2015. ^ "The Brethren of the Lord by J.B. Lightfoot". ^ Stracke, Richard. Golden Legend: Life of Saint James the Less. Retrieved 29 October 2018. ^ John MacArthur, Jr., Daily Readings from The Life of Christ, page 50 (Moody Publishers, 2009). ^ Matthew 10:2–3, Mark 3:16–19, Luke 6:11–16 and Acts 1:13. 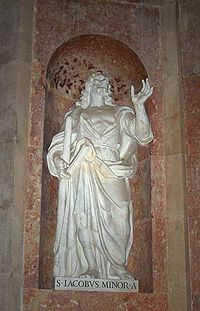 ^ "CATHOLIC ENCYCLOPEDIA: St. James the Greater". ^ Philip Schaff, History of the Apostolic Church: with a General Introduction to Church History, page 389 (New York: Charles Scribner, 1853). Citing Nikephoros, Historia Ecclesiastica II:40.